May 13, 2018 /17 Comments/in Featured Articles /by Edmund Connelly, Ph. D.
Keeping the Faith is an entirely different beast. In this film the contrast between the White goy world and the Jewish world could not be starker, for two of the three main characters are a blond Catholic priest and a rabbi. (Notice that in flashbacks to their childhood, the Catholic boy with blond hair always wears light clothing; in contrast, the young Jewish boy wears dark clothes.) Further, the shiksa lust is front and center, as the rabbi dates (and will likely marry) a very, very goyish woman. What makes this film absolutely fascinating, however, is that these contrasts and conflicts are treated openly, compassionately, intelligently and — gasp — honestly. Certainly, see this film, since Hollywood rarely offers such a balanced and insightful look at how Jews interact with and affect their host culture — it even shows us what many Jews think about us, including their negative thoughts. Here is the cast: Ben Stiller stars as Rabbi Jacob “Jake” Schram. Edward Norton is Father Brian Finn. And Jenna Elfman is Anna Reilly. As children, they went to school together in New York City, but Anna moves to California with her family and loses touch with her two male friends. Later, she returns to New York on business and resumes contact with these two men, who are now men of the cloth. Before addressing the film, however, I simply must discuss the identity of the actor and director of Keeping the Faith, Edward Norton. In this film, he plays, quite frankly, a mildly effeminate man, though that’s neither here nor there, since he’s a priest. 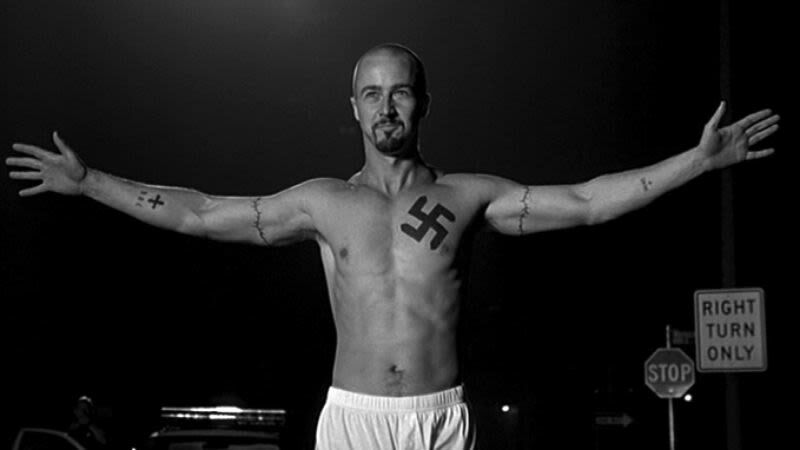 What absolutely blew me away when I first watched the film, however, was the fact that an actor with an identical name had two years earlier appeared as a vicious neo-Nazi in a movie called American History X. The contrast between the two characters is so profound that time and again I returned to the Internet to find out if they could actually be two different people. They are not; both are played by the same Edward Norton. Clearly, we need to know a little more about this amazing actor. Norton grew up in the planned community of Columbia, MD, built by none other than his maternal grandfather, the famed developer James Rouse. He was raised Episcopalian and attended Yale, where he was a competitive rower. He dated the Mexican Salma Hayek Jiménez (whose father is descended from Lebanese immigrants) for a few years but later married Canadian film producer Shauna Robertson. His father, also Edward, served in Vietnam as a Marine lieutenant and later became a lawyer working on environmental issues, a cause his son has also adopted. In American History X (1998) Norton plays Derek Vinyard, a powerful and charismatic skinhead who goes to jail for killing two vibrant Black youths who wanted to borrow his car one night. This murder scene stands out as one of the most violent and upsetting scenes I’ve ever witnessed on screen. Be warned. As much revulsion as we might feel, however, we also have conflicting emotions as well, for Vinyard did have some justification for his actions. Further, why in the world does the director glorify this neo-Nazi? In fact, in this profoundly moving scene, the director turns to slow motion and clearly presents Vinyard as a Christ figure. Why? The overall problem with American History X, and one reason why it is so interesting, is that there is a noticeable break between what screenwriter David McKenna and director Tony Kaye wanted to accomplish, and what they really did accomplish. Depending on how one views the film, one can come away from American History X with completely different impressions concerning race, racism, and race realism. I get the feeling that this was not what McKenna and Kaye had intended. 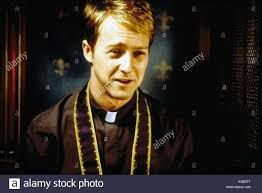 In any case, if you’ve seen Edward Norton’s mesmerizing performance here, you’ll be astounded that he becomes the wimpy but friendly priest in Keeping the Faith. Truly the mark of a great actor. Fr. Finn then stops at an Irish bar for a nightcap, but the owner, Paulie Chopra, is a Sikh Catholic Muslim with Jewish in-laws. A major theme of the movie is the idea that “we live in a world where boundaries are blurring and bleeding into each other in ways that challenge us.” And much to my surprise, the film, while certainly comical at times, addresses these issues seriously, including with respect to Jews. For once we are not subjected to anti-White, pro-Jewish propaganda. Keeping the Faith relies on jokes swirling around ethnic stereotypes, including those about Jews, so of course the older women in the film work diligently to set up the eligible young rabbi with “a nice Jewish girl.” This includes a successful young reporter, but the film also shows us a vapid Jewish woman who is so shallow that she puts false book covers over her aerobic exercise videos. Assuming the domineering Jewish woman persona, she drags Rabbi Shram to her apartment and demands that he punch her in the stomach, thus proving her dedication to her training routine. The scene is hilarious. We discover, however, that Jake may not end up with that nice Jewish girl because the plot of this movie quickly begins to revolve around belated longing for Anna, the classmate who moved away. Returning to New York on business, priest and rabbi are astonished to find that Anna has blossomed into a high-powered businesswoman, not to mention a stunningly attractive young lady. As a priest, Fr. Finn is constrained from expressing his love for Anna, though in one scene he manages to do just that. Rabbi Jake Schram, on the other hand, is free to date as he sees fit. Unfortunately, his “fit” does not always match the expectations of his mother or congregation. This perennial theme of shiksa love and the tensions it introduces into the Jewish community is the primary subplot of the movie. For instance, Rabbi Jake’s investment banker brother married a Catholic girl, and his mother responds by not speaking to him for over two years. She clearly represents the Jewish desire for continuity and exclusion; intermarriage is seen as an act of assimilation that spells a kind of death for the Jewish people. Interspersed throughout the film are comic scenes in Rabbi Schram’s synagogue. For instance, to liven up the sermon, he invites a troupe of black gospel singers to perform, which wins him wild support from some congregants but censure from others. (Watch here.) Another time, he faints at the sight of a circumcision, where a mohel deftly cuts the foreskin of an infant boy. As the story develops, it looks like Jake’s mother may be facing another case of a son pairing up with a Christian woman. Jake and Anna have fallen in love and are now having a relationship, which brings on the predictable problems. At a movie theater, for example, Jake runs into a group of his congregants. When they meet his tall blonde companion, they are none too pleased at his choice. The film, however, clearly criticizes this attitude as discriminatory. Keeping the Faith is all about pluralism and multiculturalism as ideal values. On top of this, Anna confesses to Fr. Finn that she and Jake had been carrying on a secret affair for months, and this precipitates a rift between the two men, handled comically as a drunken Fr. Finn barges into Jake’s synagogue and reveals the love triangle (sort of) that has emerged. All the while, congregants gather around the doors to hear the juicy details. Here is the scene. Soon after, Jake confesses to his congregation that he had been dating a non-Jew. This Yom Kippur sermon scene is rare, for it openly challenges the age-old Jewish hatred of mixing outside the Tribe. Have a look here. In the climax to the movie, Brian and Jake reconcile, but Anna is about to leave New York without reconciling with Jake. Brian, however, is not content to let these two friends squander a chance of a lifetime, so he encourages his friend to hurry to Anna’s office to seek forgiveness, setting up one of the funniest scenes in the movie, as Stiller uses his small stature to great effect when trying to outrun a burly but agile African American security guard in the lobby of Anna’s building. Defeated, he comes up with the idea of going to the building across the street, where he is then able to communicate with Anna, first by holding up a handwritten sign, then by telephone, which is on speaker phone so the guests at Anna’s farewell party may all share in the drama. A tearful reconciliation is made and Jake and Anna are again a couple. We also learn that Anna had been taken conversion lessons from another rabbi in order to be a better fit for Jake. The film closes with this suggestion that she will convert and marry Jake. I suppose if a movie about the Jewish man getting the shiksa has to be made, this is the best, most serious treatment we’ll get, although intermarriage between high-mate-value Whites and Jews should really be as problematic among Whites as it is among Jews and for all the same reasons. In Keeping the Faith, there is no denigration of gentile women at all. Better, the soft barbs that we do see are launched equally at the men, one Catholic and one Jewish. At no point does the movie descend into anti-White bigotry, which is something to be thankful for, given the less respectful Hollywood movies we all know about. Still, I think it fitting to close with a consideration about what we have seen — a Jewish man getting the very European, very non-Jewish woman. As anyone can see, Jenna Elfman is the very epitome of White female beauty. Tall and slender, this blonde-haired beauty sports brilliant blue eyes. I think a little background about this woman is in order. Born in Los Angeles, Elfman was originally Jennifer Mary Butala. The family name is unusual because her father has Croatian ancestry. She was raised as a Catholic. Her married, name — Elfman — comes from her husband, Bodhi Pine Elfman, who grew up in Hollywood as the son of Jewish actor/director Richard Elfman and Rhonda Joy Saboff. Bodhi is also the nephew of musician and film composer Danny Elfman. While a racial Jew, Bodhi is a practicing Scientologist, and his wife Jenna became one, too. Jenna Elfman gained fame as the free-spirited yoga instructor/dog walker Dharma Finkelstein in the sitcom Dharma & Greg. Her husband is a straight-laced lawyer named Greg Montgomery, and their conflicting personalities provide the comic energy for the show. I’ve never seen the show, but a Wiki search shows that in the sitcom, Jewish actor Alan Rachins plays Myron Lawrence “Larry” Finkelstein, Dharma’s “hippie” father. If a casting crew thinks that Jenna Elfman can pass as the Jewish daughter of Larry Finkelstein, well, I guess anybody can. Or maybe it’s an inside joke. In any case, there seem to be parallels between Dharma and Greg and Meet the Parents (especially the sequel with Dustin Hoffman and Barbara Streisand) in that the clash of Gentile and Jewish worlds is turned into comedy. In closing, I might remind readers that most of the artistic creativity of Keeping the Faith comes from Jews. Paired with the fact that the story is openly about Jews and Gentiles together, we have no need to explain how the ideas for the film came about. It’s just not a mystery.